Is Being a Connected Educator Addictive? Now that I’m using an increasing variety of tools to stay connected as an educator, I am wondering if the allure is addictive. Do I need to check each of these daily, or even more than once a day, and oh, sometimes hourly or less? With ease of access to all of these on my iPhone, I am wondering what is overkill, and I have named just a few of the apps I use daily. Each leads me somewhere else via posted links or live streamlining videos. A Twitter chat alone can be not just the hourlong, but far longer if I check all the links to resources shared or to an archive with Storify. Watching a Periscope and texting in comments is another half hour or hour shot. Is all of this time worth it? 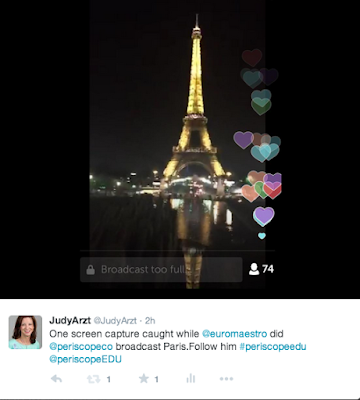 Then, there is the never-ending stream of invites to webinars and following conferences online via Twitter and notifications to check a Periscope live-stream broadcast. Look all those hearts coming in from a recent Periscope I watched and screen captures, tweeting out to the broadcaster my appreciation. We say we want to be connected educators and it helps us grow professionally and connects us with educators and resources globally. We become better educators because we are connected and learn from all those others and resources at our fingertips. But do we go through withdrawal symptoms when we need to disconnect? Last week, I dropped my iPhone in a park when taking photos. The phone was lost for a few hours. I had used iCloud to lock the phone and put out a text message alert on the phone to call a number if found. At first, I was somewhat relieved to know my phone might be gone for a day or two while I waited to decide if I wanted to buy another one and upgrade to an iPhone 6 or iPhone 6+. I almost felt a sense of relief, though I would still have my laptop and iPad to connect, but the phone really functioned as my quick 24/7 access, anytime, any place. Well, my dilemma ended when about two hours later I got the anticipated call my phone was found. Did I rush to get it? You bet. After all of this debating, I decided if I had to have one addiction (other than coffee in the morning) being a connected educator was the one. Now another commitment I need to make is to do more blogging. But every time I look at one of my blogs, I am reminded they need a makeover. Look at all those Blogger scrabbled labels hanging out on the side (Index) and all the side Gadgets that just need to go. But instead of spending time cleaning up my blogs, I am off to another online place to stay connected. 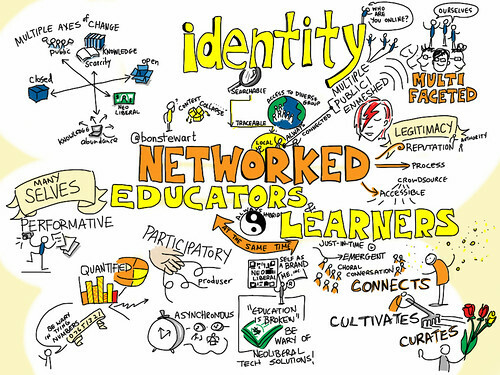 I thank my PLN (personal learning network) for getting me to this point increasingly over the time of being a connected educator 24/7, or at least almost 24/7. So is it a complete addiction when the first thing I reach for in the morning before the cup of coffee is the phone to check notifications! Oh and I do promise to clean up all those labels and other gadgets on the sidebar if I can just break myself away from checking Voxer messages, tweeting back and forth on Twitter, checking new posts to Instagram, and you following another Periscope broadcast. Oh, and I did I mention Flickr, where I need to get to now to find a Creative Commons images to add to this post. So how do others feel about being a connected educator? Do the pros outweigh the cons? So you take a tech sabbatical sometimes and disconnect?